Friday Night Fights: Ultimate Robot Battle GO! It’s the last weekend before Christmas, man, and you’ve so good for Santa Claus, you just can’t stand it no more. What better time to bust loose and get wild than your good old-fashioned FRIDAY NIGHT FIGHTS! Ya know what we need today? We need robots. We need one valiant, charismatic hero who’s gonna punch the snot out of a robot. And that one valiant, charismatic hero… is an adorable five-year-old with green hair. BAM! The Avengers need to hire that girl to take care of Ultron. 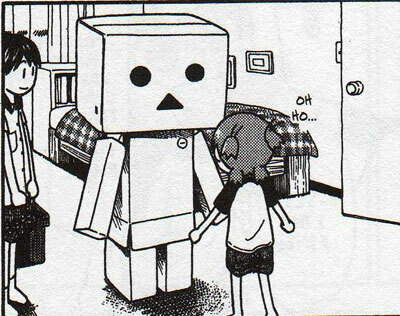 December 17, 2010 · Filed under Friday Night Fights, Robots!, Yotsuba&! 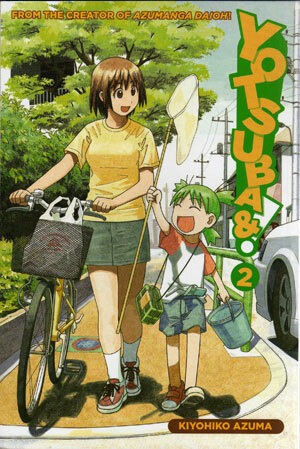 So I finally got the fourth volume of “Yotsuba&!” recently (out of eight — I still need to get a ton more). I was reading along quite merrily when I hit the following sequence that made me laugh like a loon for a good five minutes. 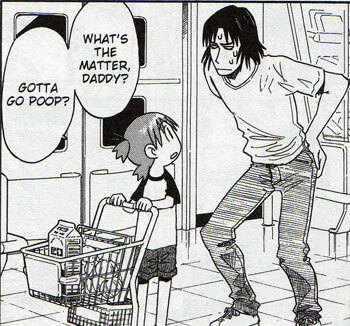 …when Yotsuba’s dad realizes that he left his wallet at home. 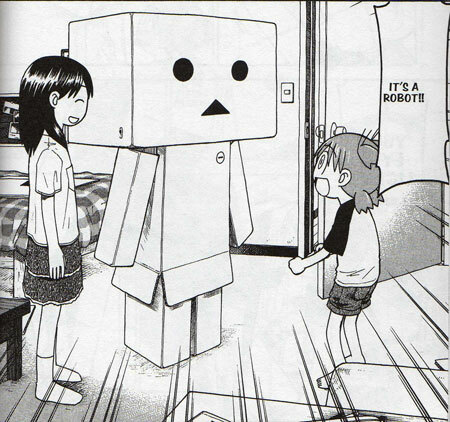 May 15, 2010 · Filed under Inappropriate!, Yotsuba&! 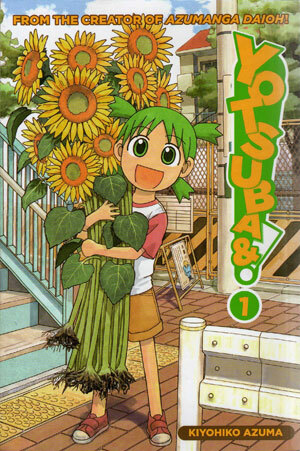 Today, we’re talking Yotsuba&! by Kiyohiko Azuma. As you might guess from the artwork, this is a Japanese comic book — what is usually called manga (as opposed to anime, which is a Japanese animated cartoon). You’re probably wondering about that funky “&!” at the end of the title — think of it as shorthand for “Yotsuba and (something)!” as every episode of this story is about Yotsuba discovering something and getting excited about it. 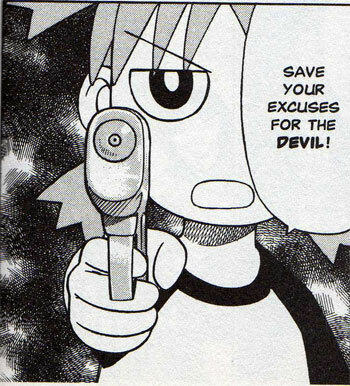 Yotsuba is our main character in this one. She’s a six-year-old girl living in a new city with her adopted father, Koiwai. 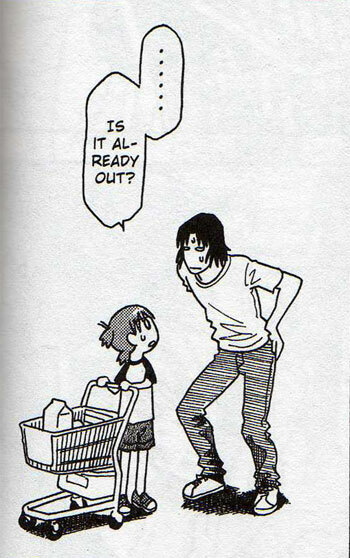 Yotsuba is fantastically enthusiastic and energetic about everything. She loves to draw, even though she’s not very good at it. She loves to swim, even though no one else she knows is very good at it. She loves cicadas, frogs, flowers, fireworks, farms, and festivals. She’s fascinated by all the things you were fascinated with when you were six, if only you could remember what they all were. Her friends include the family next door, the Ayeses, who are generally bewildered by Yotsuba, but more than willing to be dragged along with her antics and adventures. And there’s Jumbo, her dad’s best friend, who is just a shade under seven feet tall. 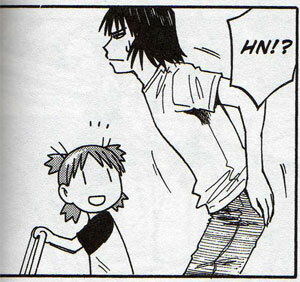 None of them are as adorably loony as Yotsuba, but they’re all pretty completely cracked. This is a slice-of-life comedy series. There are no giant robots, tentacle monsters, no evil diaries, no demons, no orange-clad ninja twerps. 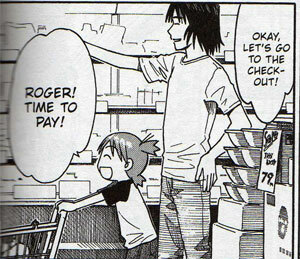 There’s just Yotsuba and her friends being adorable and awesome. I find something to laugh out loud at in every book, something to smile about in every chapter, and something that’s wonderfully fun on every page. I know, I know, the cynical thing to do is to say it’s just silly kid stuff. But there are no cynics when it comes to this book — I don’t know anyone who hasn’t read it who doesn’t end up loving it. There are seven or eight volumes of this book out on the shelves now, but here are the first three to get you started. Each one will only cost you about $10, and these days, that’s just ridiculously affordable. If you get it, remember that to Western readers, Japanese manga reads backwards — you start out reading the back of the book and move on to the front, and the panels are meant to be read from right to left, instead of left to right. It can be a little confusing at first, but it’s easy to get adjusted. 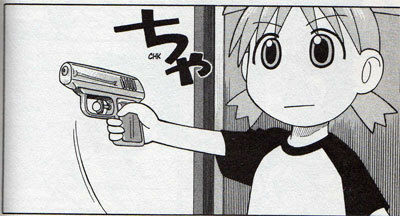 Yotsuba&! by Kiyohiko Azuma. Go pick it up. December 16, 2009 · Filed under All-Ages Comics, Holiday Gift Bag, Yotsuba&! Friday Night Non-Fights: Gun-Toting Child Assassins! We’re once again in the middle of a short break between rounds of regular Friday Night Fights, but just because SpaceBooger has called a temporary halt to the violence-drenched festivities doesn’t mean I’m under any obligation to obey. I always seem to have trouble finding the really violent stuff on these off-weeks, but I think I got the stuff this time. We’re going for something from a Japanese comic book. 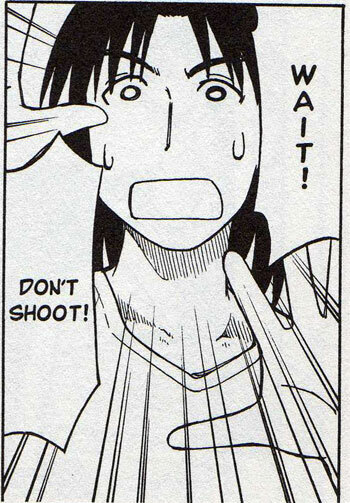 We all know how fantastically violent manga is, right? So this one’s probably going to be a record-setting explosion of violence, brutality, and body counts. 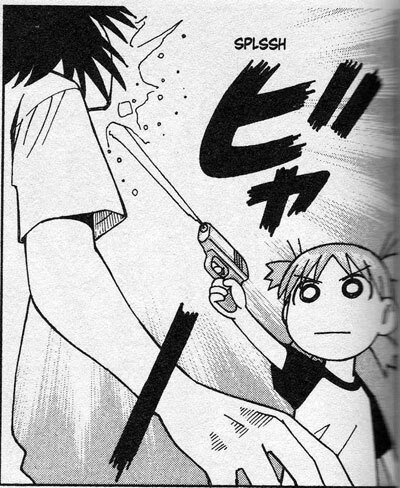 So let’s get the battle rolling — from 2005’s Yotsuba&!, Volume 2 by Kiyohiko Azuma, here’s the blood-curdling tale of five-year-old Yotsuba watching one too many gangster movies and gunning down her own father! What the –?! A water gun?! That wasn’t violent at all! I can assure you, I’m just as shocked about this as you are. I’d write a stern letter of complaint… if I weren’t too busy cooing about how cute the whole thing was. 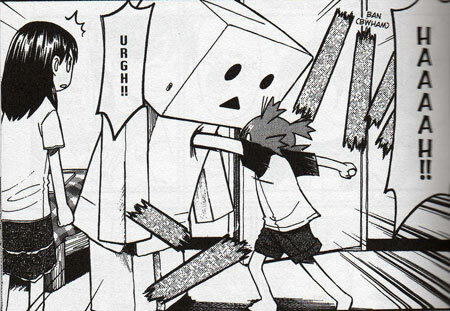 December 4, 2009 · Filed under Friday Night Fights, Yotsuba&!